Into the Woods! | OccasionalPiece--Quilt! 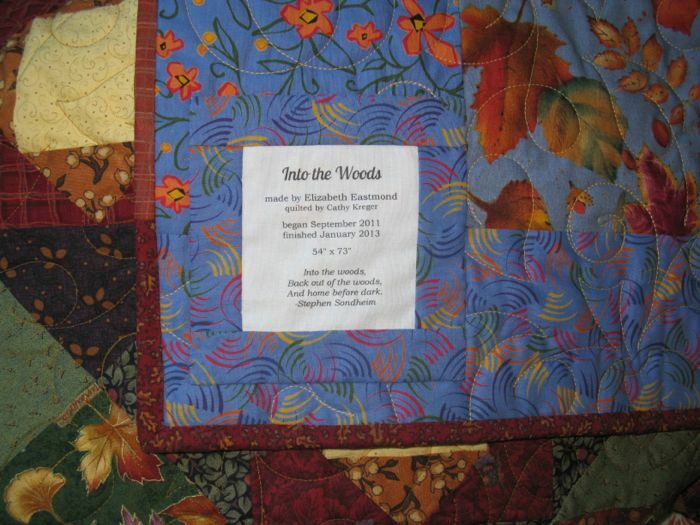 Posted on January 18, 2013 by Elizabeth E.
Into the Woods is finished–my first finish in the FAL hosted by Leanne. I blogged about how bogged down I was in my entry FAL, so it’s nice to be able to go out to the front porch, have my husband hold it up and declare it done. And yes, I know it’s January and we still have pumpkins out there. Okey-dokey, moving right along. 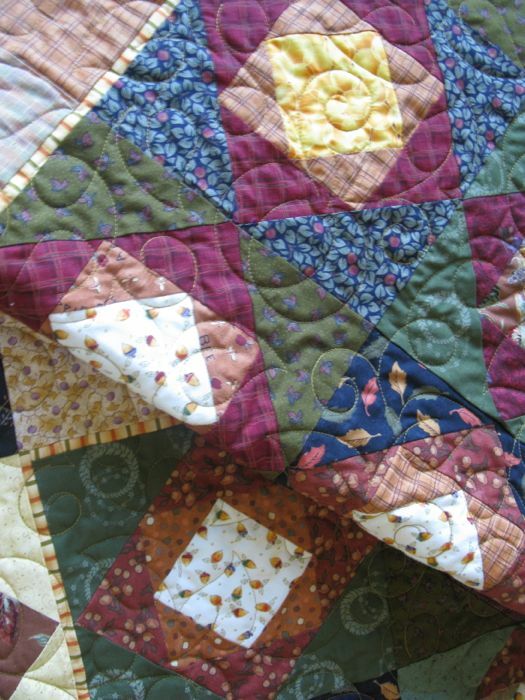 . .
Here’s a closeup of the quilting, and the blocks. And the requisite beauty shot, draping not-so-artfully by the pumpkins. Back of the quilt. 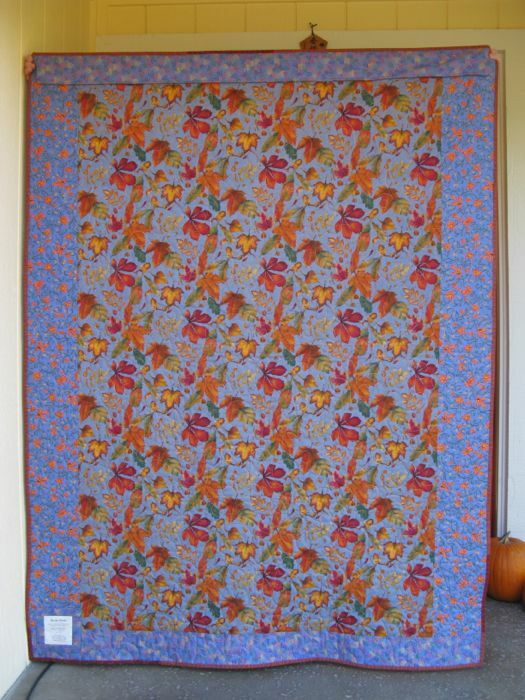 I had purchased this fabric about eight years ago, when I was shop-hopping up in the Pittsburg area with a good friend. Our husbands are both scientists and we’d see each other almost annually at conferences. This particular time I had a rental car, so we left the boys to their science and took off in search of ours. I love that certain fabrics have memories attached; whenever I see this I will think of Beth. I had originally named this a different name, mocked up the label but just couldn’t make the name stick. Then one night, it came to me. Seeing this quilt was like walking into the woods, surrounded by golds, greens, crimsons and browns, and so that became the title, just like the Broadway play Into the Woods by Steven Sondheim. That play has always had special significance for me, as its allegory of going into the woods –the difficult trials of life — and making your way back out of the woods — into a different life than the one imagined — became a sort of map for me during a painful shape-shifting time of life. I still love that play, and as I worked on the label (with a scrap of lyric pulled from the title song), I played it on the computer and sang along. Nothing like a Broadway show tune to make the quilting go a little quicker. My quilter, Cathy, did a lovely job on the quilting of pumpkins and vines (and if you know the play Into the Woods, there is a section of Jack and the Beanstock, which correlates nicely). So there it is–my first finish, and finally, a Friday Finish for myself. Beautifully done! The back stories make it so much more special. Your quilt is really lovely! I’m trying to finish one this month with a similar color scheme. Wonderful quilt and I love the title. Just lovely! Such a great feeling to finish a project that has been around for a while too! Congratulations on the beautiful work. It is a wonderful quilt and congratulations on finishing it so quickly! Normally I am not drawn to “woodsy-looking quilts”, but this one has just the right combination of colors to catch, and hold, my eye – it really is lovely! And I love your naming story as always – you are so good at that. 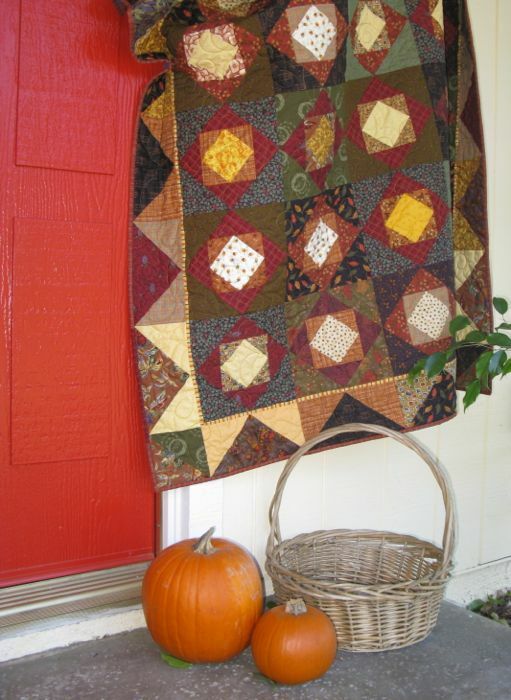 A very warm cozy looking fall quilt. Great job with using values too. And I love the fact that pumpkins are still on your porch. Ours would have been devoured by the squirrels. Congrats on getting one finished for the FAL. I still haven’t done more than take tops out of the storage box and press them. This is a beautiful quilt. I love the story of how you named it as well. Our daughter-in-law was in that musical in a university production. I have some of the fabric on the back bottom border–love it. 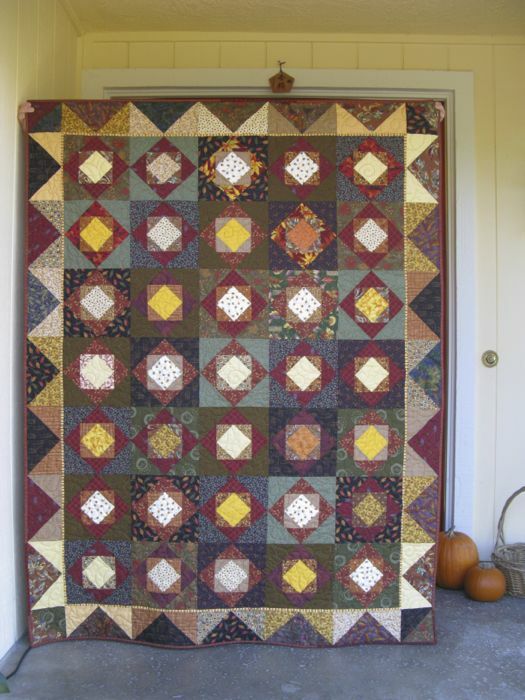 Pingback: January’s Three Finishes–FAL | OccasionalPiece--Quilt! Pingback: Finish-A-Long First Quarter Wrap-Up | OccasionalPiece--Quilt!